Your company’s treasure map is showing you what? 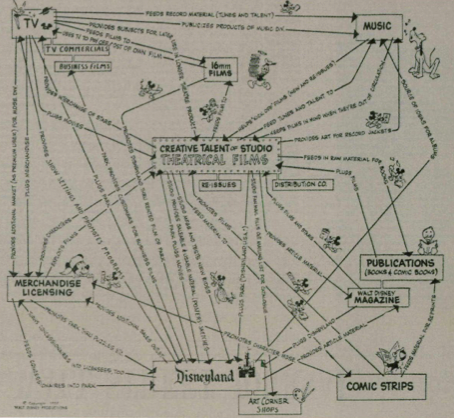 This is the 1957 map of Walt Disney’s vision. It has served as the company’s “Corporate Theory” with amazing success (with a notable hiatus in the late 1970s when it temporarily shifted away from it). Traditionally, strategy is seen as a positioning game. You discover and target ‘attractive’ markets and then you craft a defendable position based on your resources through which you either produce unique value or common value at a unique cost. (see Todd Zenger). At best this type of strategy tells you and your stakeholders how you create value right now. The key question, however, is how will you find new ways to create value? CROSS-sight: identifies complementarity your company is able to pursue by acquiring assets. You’ll find great examples of corporate theory in Walt Disney, Mittal Steel, and Apple; a not-so-great example is AT&T. Is your strategy lacking a Corporate Theory?